Kansas commercial lease agreements are designed for property owners who wish to lease their property to a determined and financially secure office, retail, or industrial business owner. 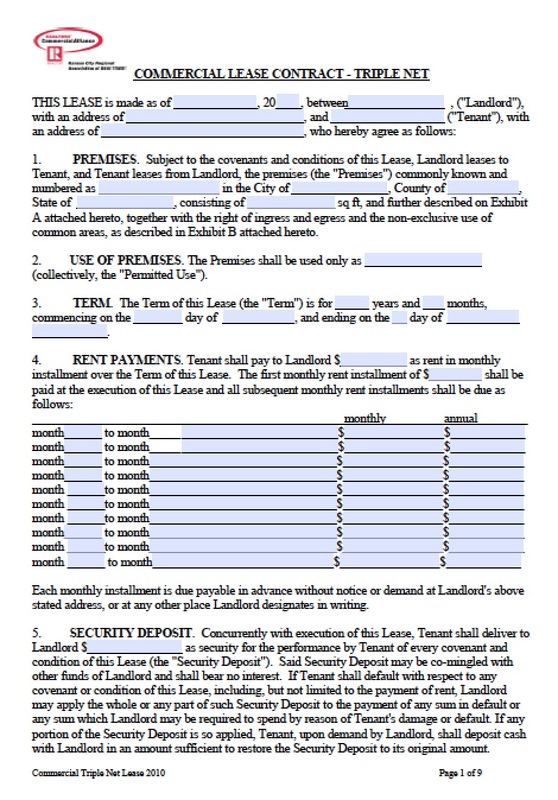 The landlord should treat the tenant with caution by utilizing a rental application that gives the landlord access to the entity’s financial history as well as the principal, also known as the owner of the business. A simple verification of the entity’s status can be completed by looking-up at the Secretary of State’s Office. Gross consists of the landlord paying for every single cost related to the property, only receiving a monthly rent payment from the business owner. The Modified Gross type is where the landlord and business owner split up the costs related to the property (the exact costs are determined before the landlord and business owner sign the agreement). Triple Net (NNN) type is where the business owner is responsible for paying all the costs related to the property, including utilities, maintenance, water, heat, parking, taxes, and the monthly rent. Overall, our Kansas Commercial Lease Agreement is sure to exceed your expectations for its simplicity and effectiveness in creating a healthy environment for both the landlord and business owner.